A great initiative, a wonderful gathering, a beautiful exchange! 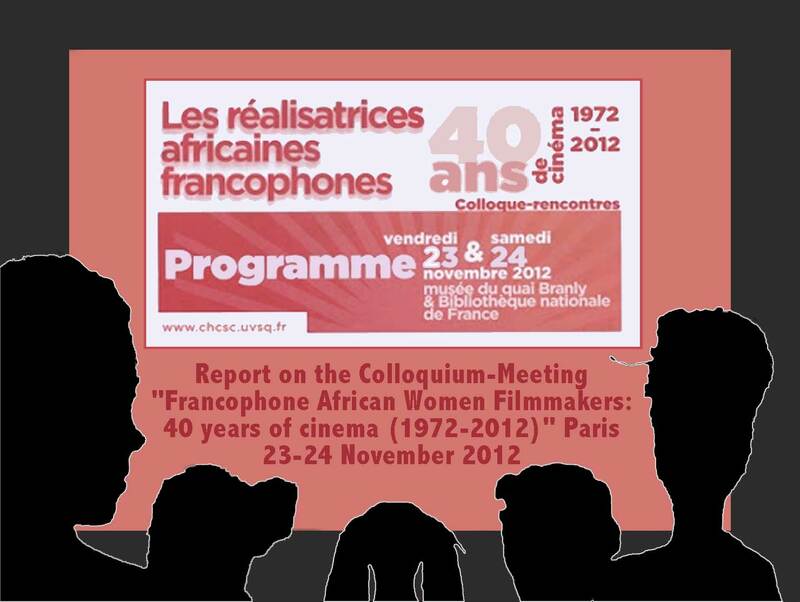 Brigitte Rollet of CHCSC University of Versailles Saint-Quentin-en-Yvelines, who conceived and organised the Colloquium, had as objective to celebrate forty years of cinema by francophone African women. The year 1972 marked the release date of two films that symbolise the 40 years of cinematic engagement of their makers--one from Africa, the other of the diaspora (with a deep connection to Angola). Senegalese Safi Faye directed La Passante, a 10-minute film set in Paris. An ethnologist as well, during her cinematic journey she has directed fourteen films. Guadeloupian Sarah Maldoror started her filmmaking path in Africa where she became involved in the liberation struggle against the Portuguese. Her film Sambizanga a masterpiece of African cinema, which reflects this struggle, has ensured her a visible place on the landscape of world cinema. The focus of the colloquium was to examine and analyse filmmakers' experiences, their films, and tendencies and themes from this historic date to the present, highlighting the continuum of cinematic engagement, research and the role that women have played as cultural readers. Organised in two parts, the colloquium began on Friday 23, November at the Museum of Quai Branly with a keynote by Beti Ellerson followed by three panels during which scholars focusing on the theme of African women in cinema presented their research. The following day, Saturday, 24 November at the National Library of France, Sarah Malador presented a Masterclass followed by three round tables moderated by specialist of cinema, during which the filmmakers discussed their films and their filmmaking path. The Colloquium began with introductions by Anne-Christine Taylor, director of the Department of Research and Teaching and Brigitte Rollet. "40 years of cinema by women of Africa", the title of the keynote by Beti Ellerson, director of the Centre for the Study and Research of African Women in Cinema, moderated by Jackie Buet, director of the International Women's Film Festival at Creteil, proposed a non-deficit approach with a spirit of encouragement and optimism. While the chronology suggested a 40 year timeline, the introduction by a pre-history intended to show a continuity of women's presence in the long history of cinema, and thus, the extraordinary story of Kadidia Pâté's first film viewing experience in 1934 in Mali. The keynote also wanted to suggest that the colloquium would be a genuine meeting place of filmmakers, critics and filmgoers. This was definitely the spirit during these two days where women from all areas of cinema talked to each other, discussed and debated, while at the same time showing a spirit of support and sharing. The first panel presentation, moderated by Brigitte Rollet, centred on the title "Questions of Identities". Daniela Ricci of the University of Lyon examined the films of Franco-Burkinabe Sarah Bouyain (Notre Étrangère | A Place in Between) and Belgium-based Senegalese Katy Lena Ndiaye (En attendant les homes | Awaiting the Men) in the context of their diasporique identity, exploring the notion of double consciousness and creolity. Lizelle Bischoff of the University of Edinburgh, who presented in English, focused on the transcultural experiences of the filmmakers Franco-Ivorian Isabelle Boni-Claverie (Pour la nuit | For the Night) and Burkinabe Apolline Traore (Sous la clarté de la lune | Under the Moonlight), as well as the protagonists of these films who are also confronted with the issue of identity. In the afternoon, still at the Museum of Quai Branly, the second panel, moderated by Valérie Berty of NYU Paris, was presented under the title, "Women's Fictions and Documentaries: Creations, politics and aesthetics". Odile Cazenave of Boston University focused on the positioning of Senegalese filmmaker Khady Sylla, both behind and in front of the camera in her film Une fenêtre ouverte | An Open Window. In the film Sylla deals with the theme of madness putting her own mental state into view. Sheila Petty of the University of Regina in Canada examined the work of Franco-Tunisian Nadia El Fani, known for making films that provoke debate and her manner of using the screen as a site of resistance. Petty also traced the recent events during which El Fani was threatened by Islamists because of the content and title of her film, Laïcité Inch’Allah | Secularism, Inch'allah, originally called Ni Allah, ni maître | Neither Allah nor Master. El Fani discussed this subject the next day during the filmmakers' roundtable. The third and last panel of the day, moderated by Carrie Tarr of Kingston, was presented around the title "Heritages and Ruptures from Independence to the Present". Patricia Caillé of the University of Strasbourg discussed her study on the works of women filmmakers from the Maghreb in the context of the history and issues relating to demands for freedom. Similarly, Stefanie van de Peer of the University of Andrews in Great Britain traced the history of experimental filmmaking of pioneer women of the Maghreb to the present. The conclusions and synthesis of the first day with Beti Ellerson, Jackie Buet and Brigitte Rollet provoked passionate discussions with the audience, which also included the women filmmakers who gave reflections of their experiences regarding the research and studies. During the audience discussions after each panel of the colloquium the filmmakers and other professionals were well represented: Farida Benlyazid, Isabelle Boni-Claverie, Claude Haffner, Rahmatou Keita, Sarah Maldoror, Annouchka de Andrade, the daughter of Sarah who is also a producer, Osvalde Lewat, Fanta Nacro, Monique Phoba, Arice Siapi, Fatima Sissani, Rama Thiaw, Voahirana Barnoud-Razakamanantsoa of Africultures, Stéphanie Dongmo, journalist and president of CNA-Cameroon, among others. This impressive showing of African women of cinema prompted Beti Ellerson to pose a question to Sarah Malador during the conclusion and synthesis: with such a strong presence of women who reside or circulate in France, why doesn't a support network exist under your mentorship? On Saturday, 24 November, still on the left bank, the colloquium travelled to the east of Paris at the National Library of France, at the François Mitterand location. After the introductions, the Masterclass with Sarah Maldoror entitled “How to make a film in Africa when one is a woman?” and moderated by Brigitte Rollet began with a rap song from her film Scala Milan AC, with music by Archie Shepp and for which she wrote the text: a forceful tribute to a pioneer and trailblazer. Through excerpts of her films, she talks about her journey. She responds to diverse comments and questions: how did she take the name “Maldoror”; how did she meet Ousmane Sembene, who was her film school classmate in Moscow; does she always look to poetry for her films; what was her experience as an assistant to Gillo Pontcorvo during the filming of The Battle of Algiers; why was the film Des fusils pour Banta never completed; what is the importance of women’s participation in the independence struggle; is there a female sensibility as a filmmaker; how did she feel when she was decorated with the award of the National Order of Merit by Frédéric Mitterrand? The first roundtable of the day “Stories, Characters, Genres: What History?" moderated by Catherine Ruelle with Farida Benlyazid of Morocco, Fanta Regina Nacro of Burkina Faso and Isabelle Boni-Claverie of Côte d’Ivoire, considered the trajectory of the three filmmakers during three decades. Farida Benlyazid began her film studies in the 1970s, Fanta Regina Nacro started in the 1980s, and Isabelle Boni-Claverie followed in the 1990s. Through excerpts of her films Une porte sur le ciel | A Door to the Sky and Juanita de Tanger | Juanita of Tangier, Farida, a pioneer in Moroccan cinema, spoke about her experiences as screenwriter, producer and filmmaker. Through her short film Les raisons d’un sourire | Reasons for a Smile, Fanta discussed her engagement with awareness building through film with a focus on AIDS and HIV, as well as the importance of girls’ education with the film Bintou and advocacy for peace with the excerpt of the film La nuit de la verité | The Night of Truth. The films of screenwriter and filmmaker Isabelle Boni-Claverie, Pour la nuit | For the Night and Le genie d’Abou pose questions about identity and representation, respectively. The three filmmakers reflected on the possibilities within their imaginary, the manner in which they envision their stories and the origin of the idea behind the film narrative. The second roundtable "Documentaries : What Perspective on the World?" moderated by Jean-Marie Barbe with Nadia El Fani, Osvalde Lewat, and Rama Thiaw, somewhat heated at times, illustrated that the ideas and practice of African women in cinema are not a monolith ! Through excerpts of her films Sderot, Last Exit and Une affaire de nègre / Black Business, Osvalde spoke about her politically committed filmmaking. Rama Thiaw reveals the world of Senegalese wrestling in her film Boul Fallé at the same time highlighting how the youth of a disadvantaged neighbourhood of Dakar use hip hop to fight against a world that marginalises them. After the analysis of Nadia El Fani's work the day before, in the round table she was able in person, to show her engagement as a cineaste known to provoke debate. During the discussion between the three filmmakers, Nadia insisted that even documentaries were constructed: the positioning of the camera, framing, lighting and choice of shots, audio, editing, choice of footage to include or not, all are in the end the filmmaker's decision. Osvalde nonetheless resists. Still another debate, this time between Nadia and Rama, reveals that the filmmaker may or may not perceive that there are specificities inherent to being a cineaste who is also a woman in terms of situations that she may confront while on location: she may be harassed or limited in her movements. However, to the contrary, Rama feels freedom as a filmmaker and does not sense these disadvantages. Are these differences in perception a question of social location or of experience? Nadia has been around in the world of cinema for some time. Is it as a feminist, as a "woman filmmaker" that Nadia has a certain sensibility as it relates to these kinds of questions? As the round table title suggests their perspective on the world is diverse, and even opposing. The third and last round table of the day, "Immigrations, exiles and African diasporas in Europe: plural identities?" with Rahmatou Keïta, Fatima Sissani and Monique Mbeka Phoba, was moderated by Elisabeth Lequêret. Based on the title, it envisioned a discussion around the diasporique positionality of the filmmakers, all three residing in Europe. Rahmatou, who spoke about her film Al’leessi...an African actress, from which an excerpt was screened, positions herself above all as a woman of the Sahel, from where she draws her ideas; similarly, Monique takes inspiration from her African roots. In her film Anna from Benin, from which an excerpt was screened, she shows the in-between world of the eponymous protagonist who lives in France, currently visiting her family in Benin. On the other hand, Fatima Sissani, who grew up in France, situates her cinema in the context of immigration, of exile. Fascinated, obsessed even, with the world of exile, her film La langue de Zahra focuses on the language of her mother, an Algerian from Kabyle, and how she expresses herself in this language. The colloquium concluded with the film Sambizanga, coming full circle at the 40 year mark of an engagement with filmmaking by women. By focusing on Sarah Maldoror of the diaspora, one may clearly note the proximity that has always existed between Africa and its diasporas, their mutual interests, their exchanges and shared support. Presently, Sarah does not locate herself as a Guadeloupian, African or Frenchwoman, but following the example of Aimé Césaire where there is no longer race or borders, she is simply a human being. Which increasingly reflects the practices of filmmakers who are embracing a cinema without borders directed by a filmmaker “period”, without a label. Throughout the colloquium there was a perceptible, I dare say, feminist spirit; with intergenerational and intercultural exchanges among the women who came together from the desire to celebrate the cinema of African women filmmakers. This very exciting dialogue highlights the genuine interest to see, discern, compare and learn.